My computer isn't currently connecting to the internet; it comes up with a message stating that it is connected to an unidentified network and unable to connect to the internet, even though I have a home network that is available. When i run a network diagnostic check it says "The diagnostic Policy Service is not running". "Suspicious outgoing traffic alert" sighted weeks prior to this diagnostic policy service message appearing. Wondering whether someone may be able to help. MpsSvc Firewall Service is not running. bfe Firewall Service is not running. MSCONFIG\startupreg: Desktop Disc Tool => "C:\Program Files (x86)\Roxio\OEM\Roxio Burn\RoxioBurnLauncher.exe"
Description: Volume Shadow Copy Service error: Unexpected error calling routine IVssAsrWriterBackup::GetDiskComponents. hr = 0x80070057, The parameter is incorrect. Description: The program GWXUX.exe version 6.3.9600.17813 stopped interacting with Windows and was closed. To see if more information about the problem is available, check the problem history in the Action Center control panel. Description: %NT AUTHORITY60 has encountered an error trying to update signatures. Description: IVssAsrWriterBackup::GetDiskComponents0x80070057, The parameter is incorrect. Edited by orwellian1984, 11 August 2015 - 01:07 PM. My name is Dan, and I'll be helping you with your issues. If someone else is helping you, either here or at another malware removal assistance site, please let me know so that I may direct my efforts to helping another user. The Staff at Geeks To Go are ALL volunteers; please keep that in mind if I don’t answer your post as quickly as you’d like. I give what time I can. PLEASE be patient. Please note that you should have Administrator rights to perform any fixes. Before we proceed, you may wish to print instructions for easy reference during the fix. Please be aware that many of the required URLs are hyperlinks in the blue names shown on your screen. Part of the fix may require you to be in Safe Mode, which might not allow you to access the internet, or my instructions. Please understand that malware removal is a complicated, multi-step process. Therefore please stay with me until I tell you that your system is clean. Please do not make any system or program changes, or run any tools unless I specifically ask you to. Attempting malware removal or clean-up yourself will only extend the time it will take to get your system clean. If you get stuck or have questions, please stop and ask so I can help you. Be sure to back up any personal data files you need to keep (documents, photos, etc.) to a USB flash drive or external hard disk. While every attempt will be made to precisely repair the infections on your computer, due to the complexity and unpredictability of malware clean-up, there is always a risk of data loss. When posting logs, please Copy & Paste the log file contents into a reply. Use multiple posts if necessary, but please do not attach them or post them on a file hosting site, unless specifically asked to do so. Until we get your Internet access going again, you will need to use a USB stick (flash drive) to transfer logs and tools to the infected.machine. Since you posted FRST logs with no Internet access on the ill machine, I suspect you have a means to do this already? It seems you have uTorrent P2P software installed. While this software may have been intentionally installed on the system, and the program itself may be safe, the files shared with these programs often carry an unknown malware payload. Some of this malware is Ransomware which encrypts user files for ransom with a time limit. Besides installing malware, the use of these programs can expose sensitive information belonging to you or your employer to the Internet, make your system vulnerable to unwanted attacks by exploiting known security issues, block your Internet access, and can possibly subject you to copyright infringement prosecution. If you do decide to keep any P2P programs, please uninstall them or disable and keep from using them until after we've finished and your system is declared clean. 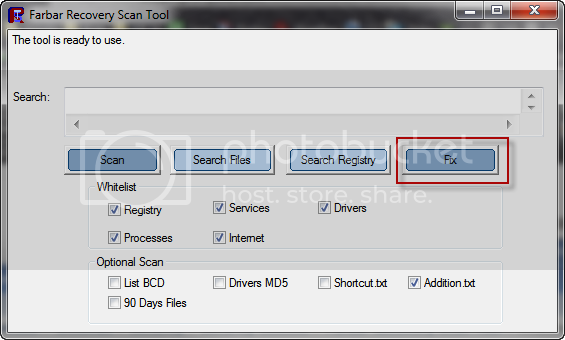 Please download Farbar Service Scanner, save it to the Desktop, and run it on the computer with the issue. Please copy and paste the contents of the log to your reply. And confirm that you have a USB stick to work with. You may disregard my question about the USB stick as I see you have a Transcend 4GB USB Stick to use... I'll be back. Can you confirm your DAEMON tools is uninstalled, and do you have the FSS log? Please post the contents of that log as soon as you have it. Run FRST/FRST64 from your Desktop and press the Fix button just once and wait. When finished FRST will generate a log on the Desktop named Fixlog.txt. Please post the contents of that log file into your next reply. Shut down your protection software now to avoid potential conflicts. See here for more information. 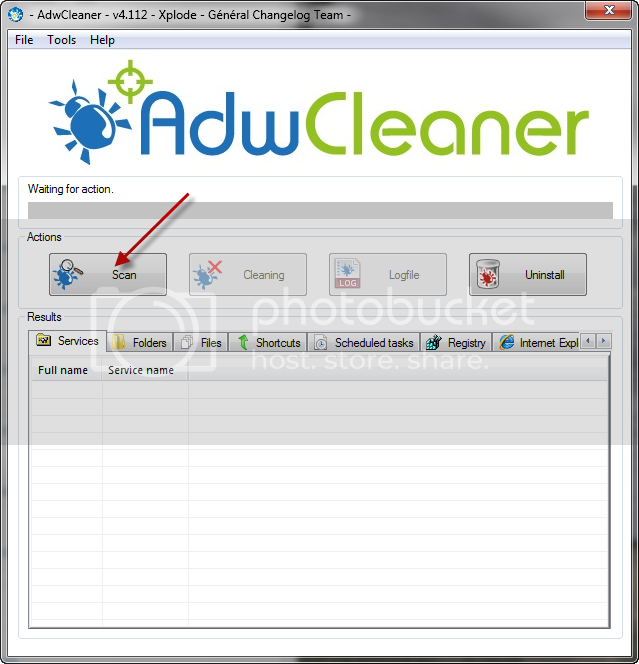 Download AdwCleaner from here or from here. Save the file to the Desktop. Note: If you are using IE 8 or above you may get a warning that stops the program from downloading. Just click on the warning and allow the download to complete. Close all open windows and browsers. XP users: Double click the AdwCleaner icon to start the program. Vista/7/8 users: Right click the AdwCleaner icon on the desktop, click Run as administrator and accept the UAC prompt to run AdwCleaner. Click the Scan button and wait for the scan to finish. After the Scan has finished the window may or may not show what it found and above, in the progress bar, you will see: Pending. Please uncheck elements you don't want to remove. Please Do Not delete anything at this time. Do not click the Cleaning button. Click the Logfile button to get the log. Copy and Paste it into your next reply. This report is also saved to C:\AdwCleaner\AdwCleaner[R0].txt. Click the X in the upper right corner of the program or click the File menu and click Exit to close the program. And tell me how the system is running. Note I did ask for the FRST fixlist contents but I meant to say fixlog.txt contents.